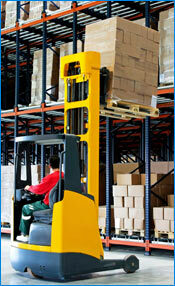 The reach truck is a narrow aisle (8'-10') truck designed specifically for racked pallet storage within warehouses. It consists of outriggers in front and telescoping forks that use a hydraulic scissors-type mechanism that allows you to pick up the load and retract it over the outriggers. This reduces the overall truck and load length, allowing you to turn in a narrower aisle. Double-deep reach trucks use an extended reach mechanism which allows you to store pallets two deep in specially designed double-deep rack. Reach trucks are designed for racking areas only and do not work for loading trucks or quickly moving loads over distances. Reach trucks are available with lift heights up to 40 feet, however, it is not recommended using them over 30 feet as it becomes very difficult to place loads at that height and puts a lot of strain on the operator's neck and eyes, a more specialist type of machine is then required such as a Man-Up VNA. See below for operator experience descriptions. Training can either take place at customers’ premises or at one of our accredited training centres.